Cringeworthy tagline aside, EA games has provided a wealth of details on the story and characters in the singleplayer campaign of its upcoming next-gen shooter, Battlefield 4. In Battlefield 4, you take on the role of Sergeant Daniel Recker, member of an elite group of soldiers known as Tombstone squad. While on your way to collect information from a defecting Russian (who would have guessed?) General, your squad is discovered, and you have to fight your way through the Russian army. Not content with featuring just the one stock-standard "Communist Bad Guy," the Chinese also get pissed about the US's implication in the assassination of some high ranking Chinese politician, so you'll have to go fight the red menace in Shanghai too. After rescuing an informant from Shanghai, along with saving the lives of hundreds of innocent civilians (because that's just how Tombstone squad rolls), you'll be sent to Singapore to rendezvous with the USS Titan and the 7th US carrier group. But oh no! When you get there, the Battleships have been sunk, "and from this point on nothing is certain," teases EA. 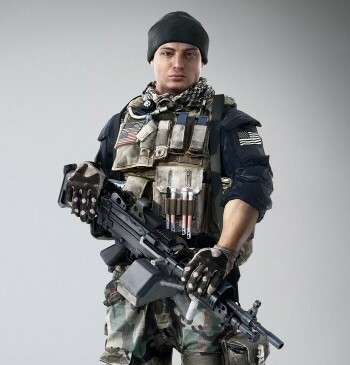 EA also provides some high detailed renders of some of your squadmates: Clayton "Pac" Pakowski, a "Marine Combat Lifesaver," and Kimble "Irish" Graves, your Staff Sergeant. No details of any kind of animal companion were given. DICE previously stated that the team will be spending more time on creating a good singleplayer story, assuring us that this time around, NPCs will be more human, and the campaign will have a much bigger impact.